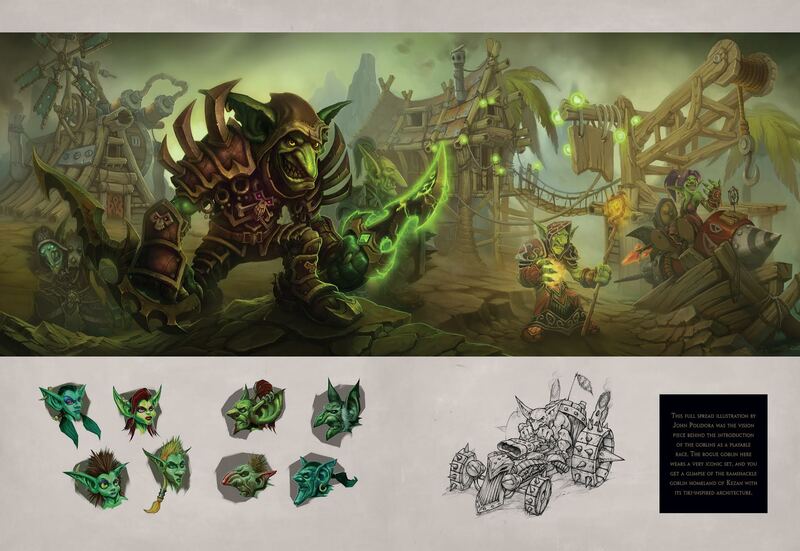 The Art of World of Warcraft is a surprisingly thin book for covering over 10 years of art from the Warcraft series and five different expansions. At 224 pages, it’s definitely not light on content. It measures 9.25 x 12.75 inches, so it’s definitely worthy of being a coffee table book. I can imagine it was difficult to select pieces that fully encompass the world of Azeroth and beyond. One of my favorite things about this book is the focus on environmental art. The environment in World of Warcraft is a character in itself. Each zone sets a very specific tone and mood. The painterly style of each piece defines the world in a powerful way that can be seen in full page spreads. The landscapes that Bill Petras painted in some of his first pieces remind me just how large Azeroth really is. 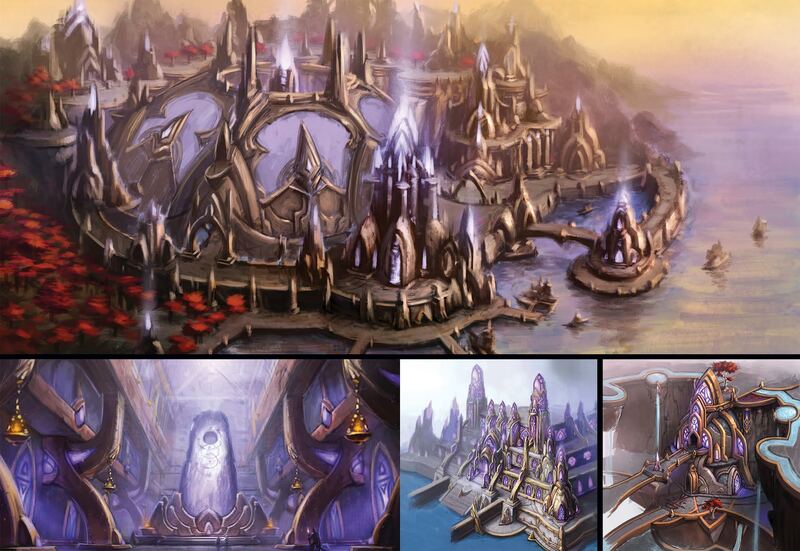 As a player of World of Warcraft since its first days, it’s apparent how closely Blizzard adheres to their concept art. It’s amazing how recognizable and familiar each image is. It’s incredible to see the crests of each faction and race as original paintings at such a large scale. I’ve always been impressed with the iconography in WoW, but I appreciate these icons so much more when I realize how detailed and thought-out they are. I would’ve liked to see a bit more imagery and explanation on the initial race concepts in the first section of the book. It ends a bit too abruptly for being the foundation of the game. The remainder of the book, about 170 pages, covers each expansion starting with The Burning Crusade all the way through Warlords of Draenor. With the introduction of the first two new races, the Blood Elves and the Draenei, are well represented in this section of the book. These pages probably brought back the most nostalgic memories for me. It was the first big thing to come to the game since I had started playing. Overall the Burning Crusade has some of my favorite art. There’s some amazing images of Zangarmarsh and the alien creatures within. Each subsequent expansion’s section follows a similar format of displaying new races and locations, with a spotlight on the main antagonist. Arthas, Deathwing and Garrosh all get a few pages of glory to themselves. The book concludes with several beautifully, familiar images of what Draenor was before it became the shattered planet we now know as Outland. The commentary throughout the book gives some thoughtful insight behind each art piece that I really enjoyed reading. I like to think I'm fairly well-versed in all things WoW, but even I learned plenty of new things in The Art of World of Warcraft. I would definitely recommend picking up this book if you’re an art fan like me and especially if you’ve played through at least one of the game’s expansions. Reprinted from The Art of World of Warcraft by Blizzard Entertainment published by Insight Editions. Copyright © 2015 Blizzard Entertainment, Inc.